What Does a Failing Capacitor Mean for Your AC? How Do You Fix Damaged Ductwork? After all, you’ve probably heard the old adage, “all you need for home repairs is two things—if it doesn’t move and it’s supposed to, WD-40. If it moves and it’s not supposed to, duct tape!” And, we agree, duct tape is a great temporary solution to many home repair needs. But, not ductwork damage! So what’s so wrong with damaged ductwork, anyway? Well, leaky air ducts are actually one of the biggest “energy thieves” a home can have. Not a lot of people think about this, but proper duct sealing and Austin, TX duct repair can stop your HVAC systems from losing up to 30% of the air moving through the ductwork. Consider what that translates to! This is air you are paying to cool your home in the summer and heat in the winter, all simply going to waste. With professional ductwork services, though, you’ll notice significant savings on your energy bills. Valid question! Duct tape was created in the First World War era. This consumer-grade, cloth-backed tape was originally intended to quickly seal up boxes of ammunition, and was actually called duck tape, not “duct” tape. There are a couple possible reasons why the name duck tape came to be—one possibility is because it was backed with duck cloth, while another potential reason is that the tape’s water resistant properties reminded the creators of how water washed off of a duck’s back. In the 1950s, duck was changed to duct, due to the assumption that—you guessed it—it would work to repair and seal ductwork. And sure, this might work, temporarily. The problem is, duct tape reacts poorly to heat and temperature fluctuations, which are naturally pretty common in HVAC air ducts. The adhesive of duct tape soon turns brittle, and the tape fails. You can expect it to last a month, maybe two, before it gives out. 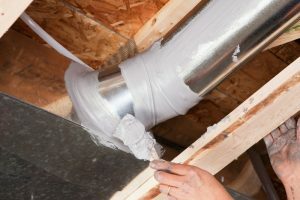 With professional duct sealing and/or repair, our technicians use specialized equipment, such as resin-based mastic sealant and metallic tapes (much stronger and more durable than duct tape) to ensure your ducts are made airtight. And it takes more than just this to effectively seal up and repair your ducts. It takes a skilled and experienced technician to accurately pinpoint where the leak(s) are coming from in the first place. If you know your ducts are suffering or suspect you have a problem, then be sure to give our staff a call. It’s natural to hear some noise right when your HVAC system starts up and when it shuts down, but anything beyond what you normally hear should at least warrant a phone call to our pros. You might hear hissing or banging coming from loose or breached ductwork, for instance. Even if it doesn’t seem to be coming from your ducts but rather somewhere else in your system, it still warrants a check by a professional to make sure nothing has gone awry. Whether you need expert indoor air quality service or HVAC care, we are the team to call. Contact Roznovak’s Services today!